Laskys (or should that be Lasky's) was not a computer company at all, but they are still worthy of an honourable mention in dispatches for being a stalwart of the home computer industry in terms of retail. They were a high-street retailer that for several years were a popular outlet for computer buyers, and this advert encompasses many of the popular machines of the moment, with the Apple II at £739 (£2,690 in 2019), Commodore VIC-20 for £159 (£580), Atari 400 and 800 (the latter being the better machine with a proper keyboard but for the not inconsiderable price of £499 (£1,820), the Sharp MZ-80A at £549 (£2,000) and the legendary Osborne 1 topping out the price range at £1,439 (£5,250). Maybe it says something about the era that Lasky's styled themselves as "The Home Entertainment Specialists", perhaps echoing the feeling that computers for the home were still largely a "toy" (even though this advert features several serious business machines). A few places on the High Street remain where it's possible to wander in and buy an actual computer at random, such as John Lewis (although these sorts of outlets mostly concentrate on laptops and tablets), but generally sales migrated towards dedicated computer shops like PC World, Apple's own outlets or mail order/the internet like Dell. Dedicated computer shops were exactly the sort of outlet that Commodore famously spurned when it first launched the VIC-20 in 1981, as they were seen to be too intimidating to "the masses". Lasky's were also not averse to a spot of co-sponsorship. In July 1983, together with the Daily Express, they sponsored a competition where eight schools shared £20,000 (£67,200 in 2019 money), the prizes being computer equipment selected from Lasky's stores. The final, at the Westmoreland Hotel in London, required pupils to design and decorate their idea of "a family home in the year 2000 using Atari 800 computers" - presumably using the Ataris to design, rather than requiring them to still be around in the homes of 2000AD. 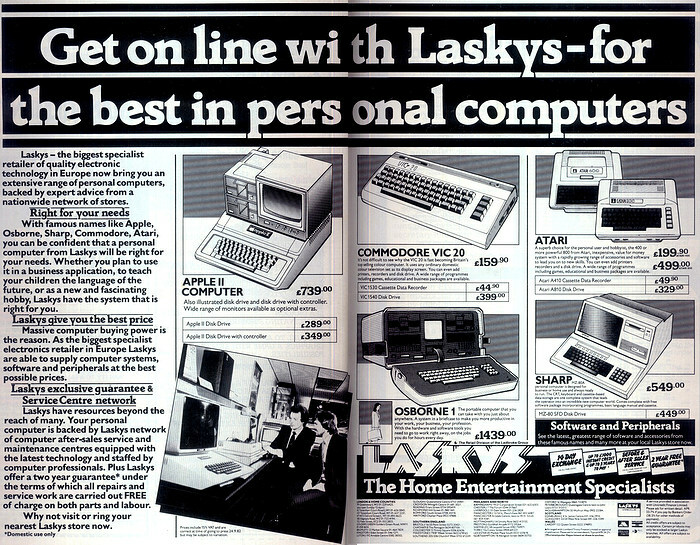 Also worthy of note is the advert's tag: "Get on-line with Laskys", showing that even in 1982 - where modems were still expensive and something of a luxury and the GPO still called the shots about what was allowed to be plugged in to its network - the concept of being "on line" was already well-established.